Stay, directed scent discrimination, directed glove retrieve. The dog will be left in a stay in any position while the handler sets up for this exercise. Six articles (including one scented) and a single glove are placed in opposite directions. Dog finds the correct scented article and returns to handler, then retrieves the glove and delivers it to handler. Purpose: Demonstrate cue discrimination, scent discrimination, and a retrieve at a distance. Equipment: Six scent articles (any material, do not need to be identical) and one glove. Exercise set-up: The exercise begins when the dog is cued to stay in any position. The handler will place six articles on the ground, approximately 8 inches apart in a random pattern, 20 ft. (6 m) ahead of the dog and 10 ft. (3 m) to the left or right of the center line. The handler will scent one of those articles and place it in the pile with the other articles. The handler will then place a glove 10 ft. (3 m) on the opposite side of the center line, on the same imaginary line as the scent articles. The handler then returns to heel position, re-cues a stay (if desired), walks 40 ft. (12.1 m) away and turns to face the dog. 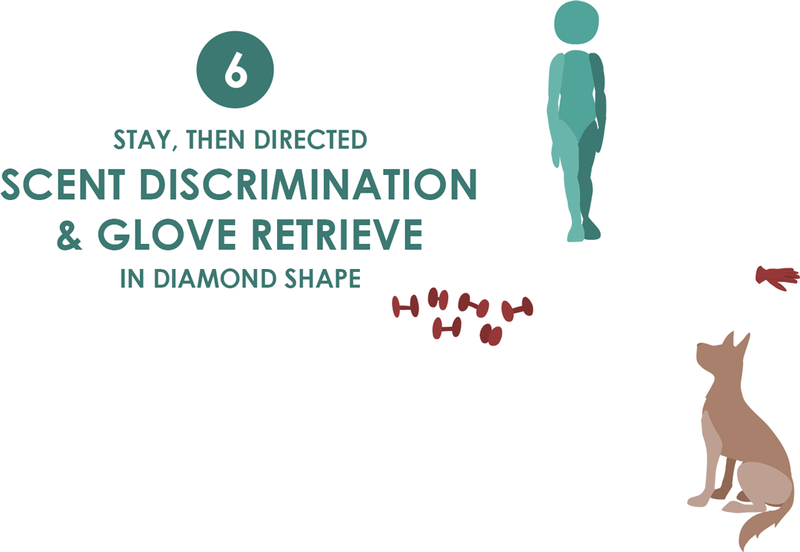 (This will now create a diamond shape with the dog and handler on the long side and the gloves and articles on the short side.) After a 2-second pause, the handler will send the dog either left or right to find the correct scent article, using a verbal and/or signal. The dog must select the correct article and return directly to front or heel position. The handler then takes the article, praises the dog, and then either sends the dog back to the original stay location OR returns with the dog to the original stay location. If the handler moves with the dog, he/she will then return to the 40 ft. (12.1 m) mark for the second portion. The exercise is repeated but this time, after the 2-second pause, the dog will be sent in the opposite direction to retrieve the glove. The dog must pick up the glove and come to front or heel position. The handler then takes the glove and praises the dog, which ends the exercise. The handler may pivot so that he/she is facing the dog on each return. Non-qualifiers: Dog does not hold the stay during the exercise setup. Dog does not perform any portion of the exercise on a single cue. Dog does not identify the correct article or the judge is unable to determine if it is the correct article. Dog does not deliver the objects to the handler in either front or heel position. Handler gives additional cues. Video does not permit the exercise to be adequately judged. Tip: Make sure the judge can clearly see the correct scented article being chosen by the dog. Consider showing the article to the camera before and after. Numbered articles might be helpful in this case.